Planetary People Press, 9780996438704, 154pp. Becoming Planetary People carries forward Thomas Berry's project of infusing the scientific version of our origins with the poetry and majesty of ritualized religion. You will find in every corner of this little book rapturous psalms penned by Conlon. More importantly, the book adds to the growing chorus attempting to incorporate the beating heart of the "new story" into the theological body of classical Christianity. 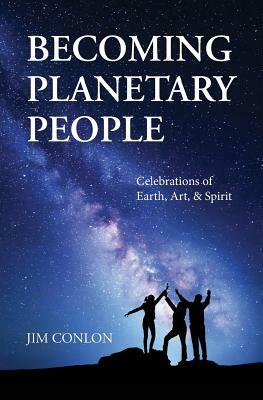 In this sense, the title of the book, "becoming planetary people," can be seen as an updating of the concept of "catholic"--a word that no longer automatically carries its own original meaning of "universal." Today, a small minority of people (and that includes people of all religions and sects) believe that the evolution of humanity into a planetary people or society is inevitable. As this happens, nation states will fall away, as will instances of famine and genocide and the worst aspects of the global poverty-riches divide. We do not believe, however, that this will happen automatically. Only by working together and in concert with the Spirit of God will this be accomplished. Becoming Planetary People is an important step in realizing this vision. And as James Conlon shows us, the renewal we long for need not leave behind the faith traditions in which we live, and from which we derive so many vital aspects of our daily existence. As such, the Christian and Roman Catholic motifs that the book calls upon should be taken symbolically, not literally, and be seen as one way of incorporating scientific narratives into a tradition of faith.